What better to do than run around with your pup on a snow day? Well…maybe cuddle with your pup with some popcorn in hand, watch a movie & sit by the warm fire. However, my husband and I took time to run around with the dog. With a medium sized dog and over 3 feet of snow, well this can be dangerous. Oreo used to be super thin. Yes, I know it’s hard to imagine-she is “pleasantly plump” now, but when she was thin she would shiver in the cold. If your dog is very thin or doesn’t have much hair consider a sweater/coat/wrap for your dog-especially if you notice them shivering. If you walk on the road during the winter and your dog is bothered by the salt consider getting boots (more expensive) or pawz rubber boots (less expensive). Build a snowman-have your dog help! Okay…well my dog will try to eat the snowball I am rolling, so it may be more fun for her. Throw snowballs for your dog to chase/catch. Oreo loves chasing snowballs and trying to catch them (please be careful you aren’t hitting your dog with snowballs). Run around in the snow with your dog-play chase! Play hide and seek! Hide your dog’s favorite toy in the snow-let your dog sniff it out. I would recommend a kong or something you can fill with a smelly treat you first let your dog sniff, then hide. Take a walk on freshly fallen snow and check out nature and the neighborhood. Enjoy the quiet and peace when no one is around and the roads haven’t been salted. 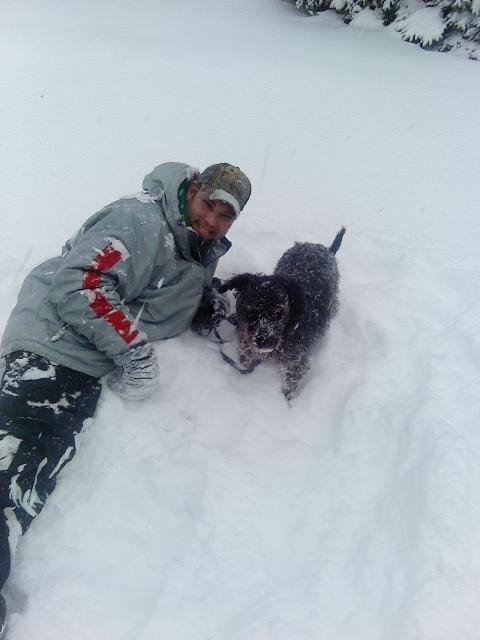 What fun things do you do with your dog when it snows? After my dog’s favorite natural beef bone went out of stock, I was forced to research different dog bones. I didn’t find much information on what is best, but rather how to pick the bone best for your dog. Bones can be safe for dogs, raw bones are recommended. Bones are great for mental stimulation, exercise of the jaw, and yummy taste! There are many different types of bones. Some bones can be used for calcium in your dog’s diet. Turkey necks, chicken wings and chicken bones can be ground and added to your dog’s food. I once added ground up bones to add calcium to my dog’s food when she was on a raw diet. Recreational bones are just that-recreational. They don’t supply a large amount of nutrition but can be fun for your dog to chew. These bones are filled with marrow and can help reduce gum disease by eliminating tartar. First you must take into consideration your dog’s chewing style. Do they nibble on bones, aggressively attack them, or somewhere in between? If your dog is an aggressive chewer-make sure you get a large bone they cannot break into pieces. Some people prefer raw bones that are frozen. If you feed your dog a raw bone, feed it somewhere it can be cleaned up properly. I have given my dog beef bones in the past (the kind you buy in the store-not the raw refrigerated kind). In our old condo I was wondering why all these ants suddenly started coming in our house-we had an invasion. For days I couldn’t figure it out-turns on they were eating the inside of the bone!! I never had this problem with any other bones, but after my store was out of stock-I decided to try a different bone-apparrently this beef bone was super tasty…to ants! I immediately threw it out. These days I use antlers. I was very skeptical about antlers, but according to research they appear to be very safe, don’t splinter, don’t make a mess-or smell! At first Oreo just looked at the antler…pushed it around….avoided it for days…but one day she started chewed and loved it! It’s time to get another one soon, and I’m very happy with the safety and quality of the item. I am an animal lover, so I make sure I buy the antlers from suppliers that have a policy of getting the antlers from animals that were not harvested for their antlers exclusively and are from the wild (not farm animals). Many articles advocate nylon or rubber bones, however I have to disagree…especially if you have a chewer. Nylon and rubber bones can be dangerous because they have many chemicals in them. In addition if your dog is a big chewer, your dog will break off pieces and eat them. 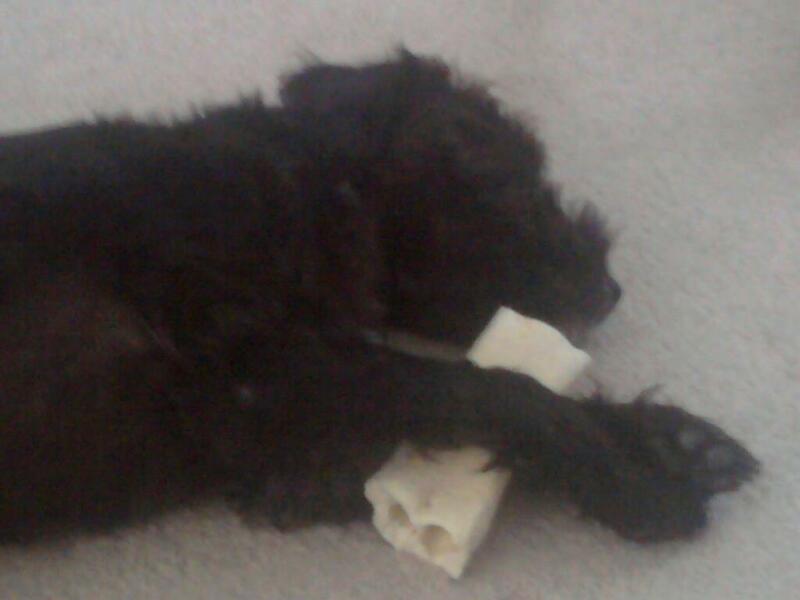 The FDA warns that dogs should not chew on bones-they should find a safe alternative bone-like product. Dogs have been chewing on bones for centuries and I understand the warnings, but if you follow some simple tips your dog will have a safer and more enjoyable time chewing bones. Always supervise your dog while chewing. Some dogs get aggressive about chewing and even if their gums/teeth are bleeding, they will continue. Also when the bone is chewed down to a small amount, throw it out-you don’t want it to get stuck in your dog’s throat. If your dog destroys bones and will be able to split it and eat it quickly, don’t give it to them. You don’t want your dog to break the bone into pieces then eat it (dangerous!). If your dog has extensive dental work-don’t feed your dog bones-we don’t want any of those crowns being damaged. If your dog does break their bone quickly, try a different, larger bone. If your dog guards the bone, try “trading” or teach your dog to “drop it”. Overall, make sure you watch your dog and your dog will have an enjoyable chewing time! Rudy-the Puppy Bowl-Oreo’s long lost relative??? Is Rudy a long lost relative of Oreo-oh how they look alike!! If you have no idea what I’m talking about-I’m referring to the puppy bowl! This little fella looked very similar to Oreo!